Created especially for Allegheny students, this interactive map features downtown businesses, dining options, historic properties, and more — complete with business information and descriptions, business hours, website and social media links, and specials or discounts for Allegheny students (where applicable). 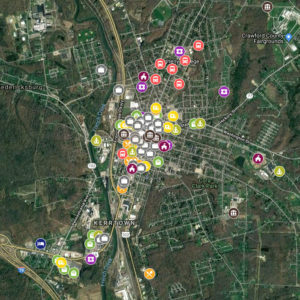 Explore all that Meadville has to offer! Allegheny students value their time spent with various campus organizations and activities as highly as their daily life in the classroom. They’re energetic, active, enthusiastic—and always up for fun. 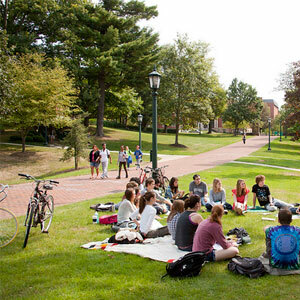 Allegheny offers over 100 student organizations including campus publications, honorary and leadership groups, performing arts groups, religious organizations, service clubs and special interest groups. Our students are involved in the life of our community, from cheering on friends from the muddy sidelines of a women’s rugby game to playfully debating Kierkegaard’s theories with the Philosophy Club over lattes at the student-run coffeehouse, Grounds for Change. 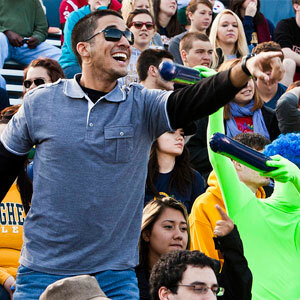 Student life at Allegheny is also about speaking up and making a difference. You’ll hear animated voices all over our campus, from the outspoken students at the Center for Political Participation to the Jazz Band’s cool riffs to the annual serenading of sorority members on the Brooks Hall balcony. Students play a vital role in College decision-making, from helping to determine policies that will influence the future for other students to hiring new faculty to programming entertainment on campus. Our Gator Activities Programming (GAP) is an all-student board that brings a diverse range of speakers, movies, comedians, bands and more to Allegheny. Student-inspired and -directed organizations and activities help students develop leadership skills and make a lasting impact on Allegheny’s campus culture. That’s because Allegheny is all about active learning and fun—not just learning about foreign policy in class, but arguing for change. Not just writing papers on social activism, but working to educate others. Our students create, laugh, dance, play, explore and serve together every day. As they make their mark on Allegheny’s rich campus life, they’re also developing the unusual combinations of interests that drive them to learn and succeed.